We’ve always seen videos of animals helping humans and humans helping animals when one is in danger… but often only on animals helping animals. 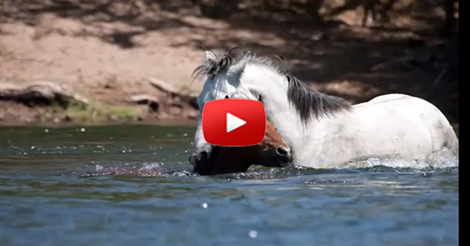 In the video below, Champ the wild stallion saw one of his family drowning so he came to rescue together with other horses. Champ bites the drowning horse in the neck and does not let him go until he is sure he is safe. It is a rare sight to see this kind of scene and it’s the most beautiful one. I love seeing them helping one another. I was almost in tears watching this video. It’s touching and amazing.